We each have a dream of love that we are awakening to in this life, a dream to manifest the purest essence of our heart into the world and into life. Tonight we invite you to awaken your dream. Munay-Ki is the Power of Love. To the Incan people of the Andes Mountains, Munay-Ki is one of the three essential forces of the universe. It manifests as universal love and our connection to that force. Being blessed with the spirit of this love empowers us to dream our world into being. Coming from the Sacred Valley of Peru and passed to us by Quechuan descendant, Maestro Tito La Rosa, we bring an Ancient Incan Flower Ceremony to bless and strengthen our connection to the power of Munay. 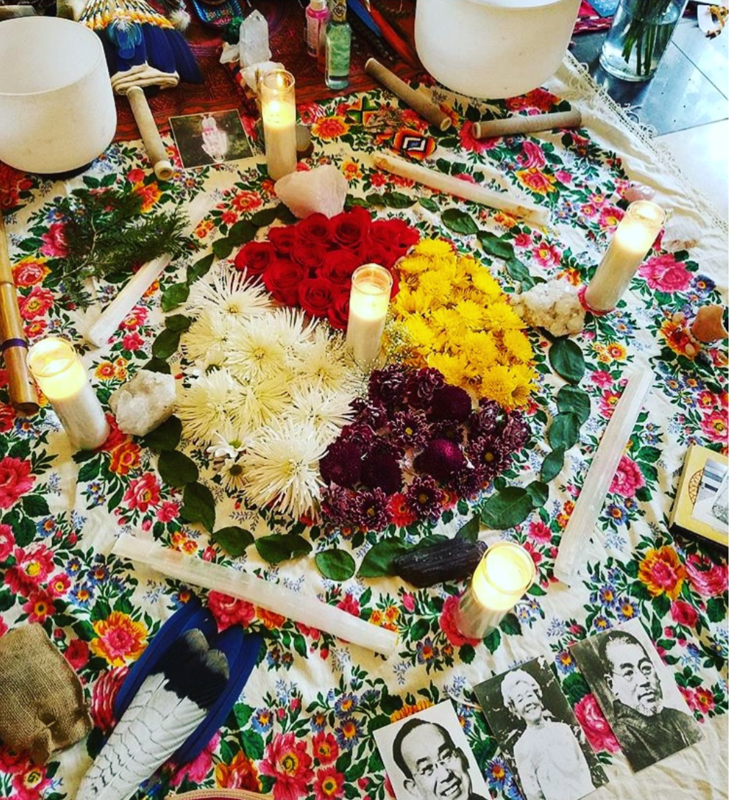 Combining the teachings of the chakana altar, the healing vibration of song and sounds, and the medicine of flowers. Participants are encouraged not to consume alcohol or any harsh substances for at least 36 hours prior to the ceremony. Nicole Adriana Casanova is a student of Maestro Manuel Rufino, a Taino elder who founded Golden Drum cultural center in Brooklyn, New York. Nicole is a writer, poet and storyteller, a 200 RYT Yoga Alliance certified Yoga and Meditation Teacher, a certified Reiki Master in the Usui and Karuna Reiki Riojo, a Shamanic Practitioner, a Human Movement teacher and Magical Awakening Practitioner. Nicole blends decades of expertise in the wellness and holistic field to create one-of-a-kind empowerment experiences in groups as well as one-on-one settings. As a Soul Architect, Nicole bridges practices and teachings from various wisdom traditions around the world, with intuitive knowledge and practical know-how to create one-of-a-kind blueprints of empowerment, healing and remembrance. Adrian DiMatteo is an international performing and recording artist, music educator and sound healer with over 16 years experience in the music world. He performs original songs and carries sacred chants and mantras from ancient native, tribal, and indigenous cultures. Adrian teaches guitar, voice, music theory, songwriting and the principles of sound healing. He regularly facilitates and takes part in healing retreats and workshops around the world.